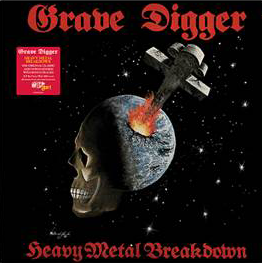 Grave Digger - "Heavy Metal Breakdown"
Grave Digger’s seminal debut album Heavy Metal Breakdown was a benchmark for the German metal scene upon its release back in 1984. This remastered version includes the rare Shoot Her Down EP and liner notes from front man Chris Boltendahl. The LP is a double gatefold, which includes lyrics, memorabilia and comes as a limited edition red vinyl. The vinyl has been out of print for over 30 years!